I know it's tremendously bad form to start a review by waxing lyrical about a competitor's offering, but bear with me. I really, really love Endura FS260 Pro II bib tights. They are, without doubt, the best I've ridden in for fit, comfort and quality. 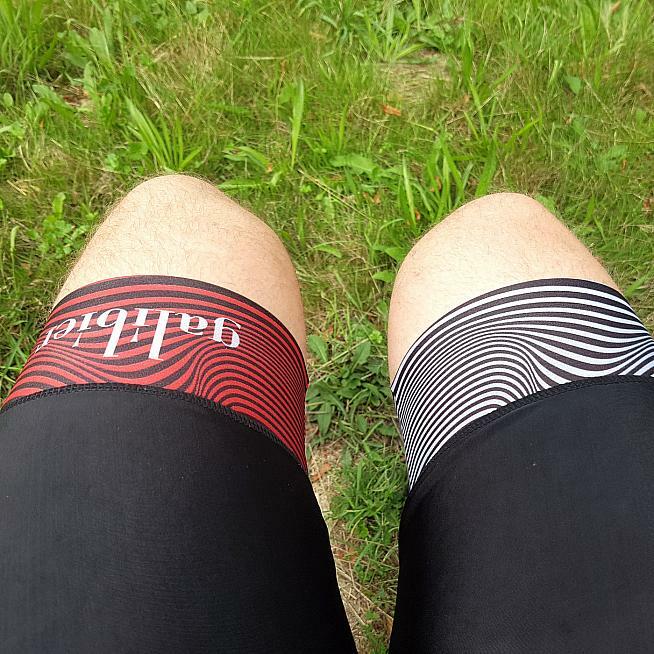 I was utterly heartbroken that they wore out on my recent trip to France and they had been, up until then, my go-to leg wear choice for rides over 50km. When they broke, though, they broke bad. The thigh grippers, and material around them, that had bravely contained the awesome beneath for 100s of kilometres gave out so spectacularly that it was like the final parade in the story of the Emperor's New Clothes. Meanwhile, in the soft hinterland between my chamois pad and my tummy hair, an experiment in attritional warfare was developing that would have the same effect as popping scrunched up tinfoil in your armpit during a 24-hour Birdie Song-a-thon. Thus disillusioned with my previously favourite bib shorts, I was on the search for something new to squash my lower half into. Having previously been impressed with the quality and value of kit from those Galibier chaps, my interest was piqued by their announcement that they were upgrading their endurance Pro 5 bib shorts to the Auron Pro 5. This warranted closer inspection. 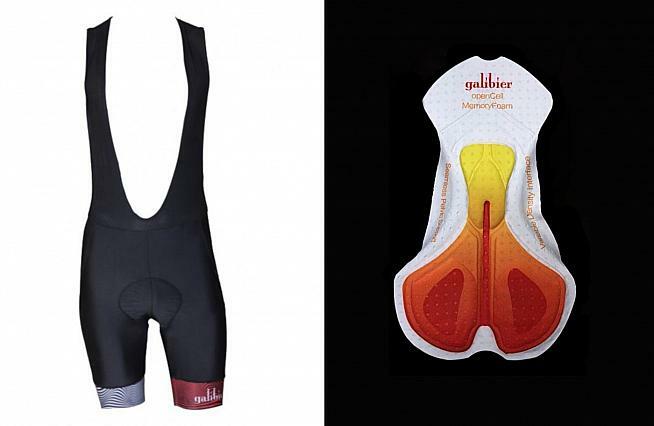 The new Pro 5 Auron bib shorts from Galibier. Coming in at half the price of my no longer (En)durable cast offs, they boasted a host of similar features, including a pleasingly orange and yellow sunburst pattern on the inside reminiscent of the finish on a Fender guitar. The chamois pad is made of '3D open cell memory foam' that should last for several seasons, although I'm not sure what memories it will collect and be haunted by, being crammed into my gooch for hours at a time. The shorts themselves are constructed from 200g, four-way stretch Italian lycra which makes them comfortable and non-restrictive. The legs are augmented by 10cm bands of graphic leg gripper that supports without noticeable compression. I have the legs of a pro-tour sprinter but the body of a Mercedes Sprinter and I had no problems with the fit, especially once cycling. My first trip out in them was a four-hour sortie on the route of a sportive I did a few years ago, with lots of climbing, in and out of the saddle, and some opportunities to get down into a rouleur's tuck and bang out some big ring efforts. The only numbness I detected was in the brain when I took a wrong turning off the route, but that offered up the chance of a snack stop at a garage. It was only when I got home that I realised that I'd forgotten to (cough) lube up with anti-chafing cream, but I had no areas of concern during my post-ride ablutions. I still love the FS260s but these Auron Pro 5s are easily as good, and with the money I save I can go ape-crazy on Galibier's website and pick up some socks and a jersey too - and still have change to buy another sausage roll at the Tesco Express. 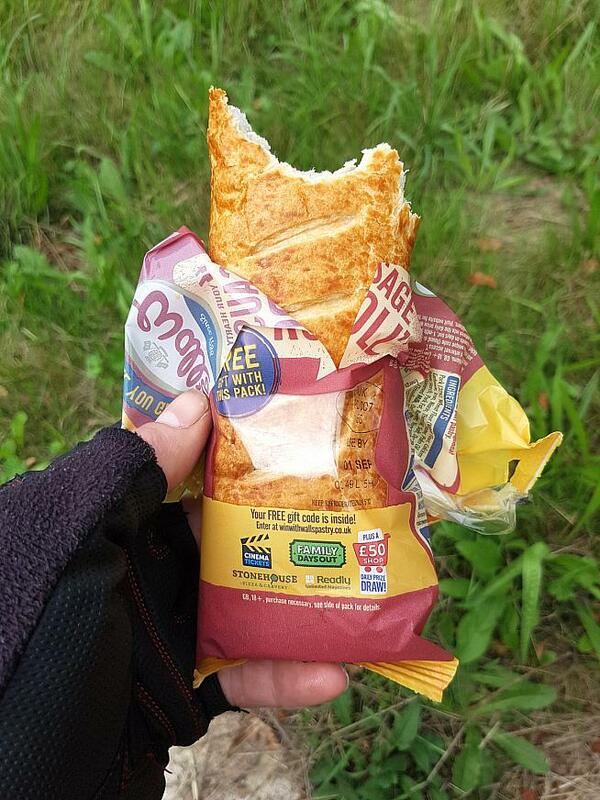 The golden pastry may bear passing resemblance to Galibier's new chamois. But don't mix'n'match.